As angry as he seemed, Huang Yiqing (黃毅清) has decided to put aside his pride and apologize for the erratic Weibo rants against wife Crystal Huang (黃奕). Married in 2012, Crystal and Yiqing were a picture perfect couple. The two welcomed their daughter in January 2013 and the family appeared loving in public. 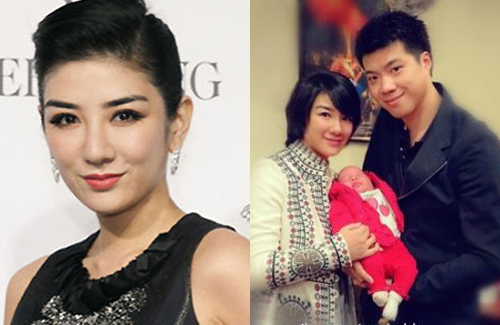 Crystal decreased her workload to care for her baby, and on Weibo, she often shared her thoughts about motherhood and cried over news of abused children. On November 25, Yiqing shocked the world when he fiercely criticized Crystal online, seemingly determined to destroy her public image. He accused her of being selfish and vain, claiming that she is emotionally abusive and often manipulates others by playing victim. He also attacked her personally, saying she is terrible at math and concluded that she is simply crazy. To further support his claims, Yiqing later uploaded a video of what sounded like a heated argument with his wife. Amidst the shouting matches and the baby’s cries, Crystal had apparently taken out her frustration on her daughter, dropping the child roughly on the floor. Slightly past midnight, Yiqing once again vented on Weibo, demanding Crystal to return home to sign what was implied to be divorce papers, declaring that he could no longer tolerate the situation. The public is abuzz with speculation about their marriage troubles. Regardless of the truth, many find Yiqing’s online attacks tasteless and some are skeptical about his true intentions. A few netizens believe that the recorded scene was staged, alleging that Yiqing had purposefully angered Crystal in order to capture her at her worst. I don’t like man saying bad things about their other half in or after relationship. I think it reflects badly on that man’s personality. Why hold men to those standards and not women? I’m sure you wouldn’t care if a woman complained about her husband or an ex. A man should never be abusive to his wife, and bad mouth her, what more in the very very public domain of weibo. That means he did it intentionally and with vendetta. His behavior is totally tasteless and deserves no sympathy. If I were Crystal, I will kick him out the door and take the baby away from him. Period. Get lost, trash. There were many great guys for Huang Yi to marry but yet she married him. Maybe he has many good traits that we do not know? I do not think it is fair to judge based on just this incident. He can have other problems that no one knows about. Not to say what he was right but hope he learns to not to do so again. We started to judge when he made it public. He should of thought about it before he post for the world to see. This man has bad judgement himself. True that what he did was wrong, but who in their life has not made bad choices and decisions? I think he is ignorant about what Crystal is going through so did not know how to handle it. I think they have a lack of communication which is one of the most important factors to a happy and lasting marriage. @HeTieShou: True that what he did was wrong, but who in their life has not made bad choices and decisions? This is not merely about making bad choices and wrong decisions, but more about a man’s character. The very fact that he even deigns to egregiously shame his wife so publicly on an open forum says much of the kind of man he is – an immature man not to be trusted. Btw, his weibo entry said the baby was almost dropped (as opposed to “dropped” as reported) during their argument. In between his numerous vitriolic rants and the current apologetic weibo entry, he also responded to his critics with a defiant entry whereby unrepentant even belligerent he insisted that he was not being immature or irresponsible or that he did anything wrong. In another post he also responded to a weiboan that if not for Crystal accidental pregnancy they would not have gotten married. Understand that though his vitriolic posts are deleted from his site (though never from cyber world), the hurt and damage done to his wife is insurmountable and can’t never be erased, ever. The trust between them is broken, who knows when next he feels like it he would even upload worse video(s) than their audio argument online? My thoughts are – this guy is eating his own words now cos he has been threatened with a lawsuit by Crystal. Nothing makes a guy like this back-off other than that. Both cuckoo, my sympathy lies with the child who have to know them as parents. he sounds more crazy than her…so pathetic..
she should asked for divorce from this man. Crazy, immature, petty, and cruel to boot. I also think Crystal should divorce him. Who knows what he would do next to hurt if not downright destroy her? It doesn’t make sense that these were posted by one of the subjects in the video. This COULD just be a move to highlight common HK-style behavior so that the public can identify with the situation, feel that they are not the only ones in this situation, etc. I saw a mother in Hong Kong speak to her daughter in the exact same way as in my family and it helped to see that the daughter didn’t do anything – the mother was just unhappy. He sounds like a drama queen. Yes, I did say “he.” Who would wanna air their dirty laundry in public? Men are usually not this exhibitionistic. He’s acting like so many Hollywood celebrities with their drama-filled lives exposed for public consumption. Using his daughter as PR. That’s so fake. A case of shutting the stable door after the horse has bolted imho. maybe this is true, crystal is really crazy, now trying to cover this up for career sake.